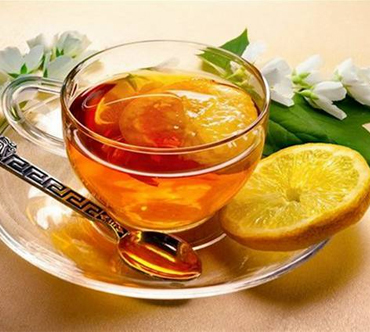 Lemon Green Tea Green tea and lemon are super potent foods that are recommended to be consumed daily. Together the two not only enhance the taste of the beverage but even extends your lifespan by fighting cancer and improving immunity. According to Purdue University, lemon boosts the health benefits of green tea, as citrus juice makes green tea’s antioxidants more readily available for your body. Catechins prefer an acidic rather than alkaline environment. As the tea passes from your stomach — acidic — to the increasingly alkaline environment of your small intestine, the catechins are broken down. Your body can absorb up to six times more catechins that it would otherwise by combining lemon juice with your green tea. While compounds in tea can inhibit iron absorption from foods in your diet, drinking your green tea with lemon reduces that effect.